Best film I've seen this month. Wonderfully dark with great lighting and framing. The suspense is felt throughout, and the influence this has on later, more well-known films is obvious. When I first saw this movie, it totally blew me away. When I rewatch it, it still never fails to impress. It's so well done, dark and way ahead of its time. As Trevor said above, you can also see direct influences from this to many other films that came after. This is definitely one of my all time best surprises. Wow, Kim Hunter TWENTY FIVE years before Planet of the Apes. That was my favorite part of the film. I also liked the lighting, which guided the viewer into the back alleys where the cult was hiding. The cult itself is probably my least favorite part, seeing as how they are probably the least menacing devil worshipers I have ever seen. I think they were toned down because of the "witch hunt" that had been going on over the censorship of motion pictures throughout the 30's. Regardless, this was a solid film that certainly influenced the industry later. Just look to the shower scene for proof. Val Lewton's darkest, most pessimistic film is sort of like the cinematic equivalent of Billie Holiday's "Gloomy Sunday," in that it has about it an unrelenting feeling of doom. Even Hugh Beaumont, Ward Cleaver from TV's "Leave It to Beaver," seems weighed down by the oppressive atmosphere. And what a nihlistic ending! 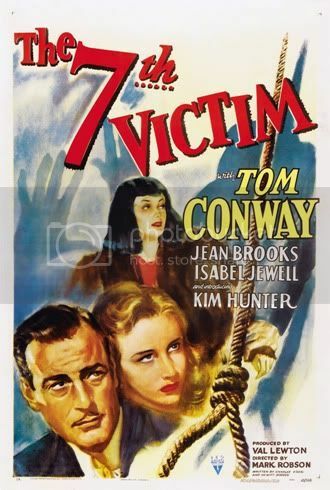 Although it's not my favorite Lewton film, it's probably the most effective of the bunch. Not the kind of film you need to watch if you're taking antidepressants. Thanks, Noirfan, for putting this on the list. I agree that it's the least scary cult ever, but still a genuinely creepy film, with tight storytelling and great performances. What I really liked was that (unlike many films of the era) I had absolutely no idea how it was going to end.